THE AMATI FOUNDATION is a new kind of nonprofit organization: one that believes dramatic changes can be achieved through innovative thinking and inspiring new approaches to solving problems. The Amati Foundation is a 501(c)(3) nonprofit organization based in Pasadena, California, United States of America, that is dedicated to the preservation and expansion of the stringed arts. It was formed in 2000 on the belief that music, when used effectively, can play a central part in global conflict resolution. By teaching children, teens and young adults via the beauty of music, whether performances, the making of musical instruments or the study of music composition, they achieve a better understanding of cultures, global harmony and a more transparent view of information. Music also add richness to all our lives and has proven pedagogical effects on mathematics and higher order thinking skills. The Amati Foundation has developed a global multi-tier approach to supporting music initiatives that addresses multiple segments of the music industry. From orchestras and musicians to museums and patrons to instrument makers and students, every facet of the Foundation’s effort is dedicated to improving access for children, teens and college students to music education while helping to strengthen the industry as a whole. The result is to increase common threads between cultures and countries and strengthen ties among people around the world. The stringed arts ecosphere—defined as those involved with or having an interest in violin, viola, cello, bass and easily expandable to include guitar, sitar, erhu, guitarron, dutar, yángqín, taar, oud and others—encompasses everyone from the people making the instruments (the luthiers) to the musicians (both amateur and professional), teachers, manufacturers, recording companies, broadcasters, museums, and numerous other individuals and organizations. While seemingly different, are all connected by a love of the music and the musical instrument. The Amati Foundation’s programs strengthen this bond while exposing the joys of music instruction to the global community. But having a good idea is only one element of creating a successful organization. Like a jigsaw puzzle, the pieces must fit together to form a complete picture. The Amati Foundation’s innovative approach to solving many of the issues facing music and strings instruction stem from more than ten years of in-depth study into the root causes of these problems. The goal is to create a global community of people inextricably linked by their love of music, interest in education, commitment to cultures and sharing the unique attributes of cultures with others, and the opportunity for governments to interact at the most basic level of civilization—the arts. Our programs address a multitude of American and global audiences to impact school-aged children and teens, orchestras, museums, patrons and the general public, instrument collectors and owners, professional musicians, researchers and historians, and violinmakers. What's happened in American music education? The past forty years have seen arts programs come under increasingly difficult obstacles. 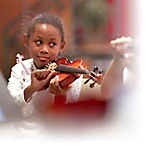 In 1960, over 80% of all public schools offered strings (violin, viola, cello) instruction. Today, public funding of stringed instrument education has declined to the point that fewer than 19% of school districts in the United States now offer a strings program. Self confidence, pride, empowerment: all await the young player. A primary goal of The Amati Foundation is to preserve and expand the stringed arts through innovative and cost effective programs that encompass industry, communities, elementary and secondary schools, and most importantly, our children. The Amati Foundation provides programs to support orchestras, museums, music schools, contemporary violinmakers, outstanding young performers, professional musicians, children and teens, and expose classical music to tens of millions of people around the globe. These programs also enable hundreds of thousands of school-aged children to gain first-hand exposure to classical and contemporary stringed music, often in geographic areas where they would never have the opportunity to experience a live performance. rapidly decreasing availability to students. The Amati Foundation Education Program focuses on finding and providing musical instruments to outstanding young performers. This ingredibly cost effective program matches musician to instrument owner. The musician gains an essential "tool-of-the-trade" and the instrument owner knows their fine instrument is in good hands and being used to launch someone's career. As part of this initiative, the Foundation has teamed with industry sources to develop an acquisition and loan program which it hopes will launch within the next 2-3 years, thus providing exceptional quality rare Italian Master instruments to dozens of talented performers. beyond the reach of aspiring musicians. The Amati Foundation loans fine instruments, both historically important and contemporary, for short- and long-term use to outstanding musicians as they pursue their education and careers in music, arming them with the tools required to become successful. The Foundation maintains a collection of rare and new instruments, donated by patrons and at times acquired by the Foundation, for the sole purpose of providing talented young performers essential tools-of-the-trade to help launch their careers. The Amati Foundation is also the creator of the Institute of Stringed Instrument Studies (ISIS). The ISIS program will become the world’s leading stringed instrument making (aka lutherie) school with a focus on the making of musical instruments and the entrepreneurial business of music, such as marketing, research, language, performance, acoustics and physics. These knowledge areas are not collectively taught at any of the leading craftsman schools, but are critical to developing individuals capable of fulfilling multiple professional roles and becoming successful in the global music ecosphere. It is planned that ISIS will be offered at a minimum of six educational institutions, beginning with the University of Texas at Austin, with plans to extend the program to dozens of countries over the next 20 years, offering students and faculty extensive interaction between ISIS participants and those of other on-campus departments, universities and countries. support the financial health of orchestras. Through an innovative global endeavor called The Amati Foundation Historical Collection, the Foundation will support orchestras, museums, corporate partners and benefactors, violinmakers, local communities, and school-aged children. This 20-year program will generate millions of dollars of publicity for its benefactors and partner symphonies, support the careers of the next generation of great violin makers, and attract new patrons to the arts, while providing the means for thousands of children to gain exposure to classical music performances at many of today's leading orchestras and symphonies. With a global reach of over 200 million people, the Historical Collection has been called, "...the most ambitious project I have ever heard about. It is so well researched, so vast in scope, yet simplistic in concept." The Amati Foundation completed a 3-year international research study on classical music, orchestras, and consumer attitidudes toward attendance of classical events. The study, published in The Strad Magazine, and available to any symphony director at no charge, uncovered specific action items that can be implemented by orchestras to increase attendance and customer loyalty and thus, enhance the financial standing of the organization. Download the survey overview by clicking here. Send your check or money order to: The Amati Foundation, P.O. Box 438, Pasadena, CA 91102 USA. Thank you. The Amati Foundation was featured in Los Angeles Times Magazine in December. In June, founder Bill Townsend was featured in an article about The Amati Foundation. In the article he talks about everything from his journeys to China to influences of Ted Nugent and Aaron Rosand to how local chapters are being developed across America. Download an Adobe PDF file of the article by clicking on the link below and feel free to e-mail, print, or share with everyone you know. The Amati Foundation is a 501(c)(3) nonprofit corporation. Your donation may be tax deductible. Please consult your tax advisor. ** Please send e-mail for fastest response. Purchase your music and violin books (and any other items) at Amazon.com and they'll donate 15% of your purchase price to The Amati Foundation. J.K. Delzell and P.F. Doerksen's study which appeared in American String Teacher(2000) found that 18% of schools in America offered a stringed instrument instruction program. They learned that students in string programs were generally class leaders and were typically female and white, with racial/ethnic enrollment participation that reflected the individual population of each school. While student enrollment has steadily increased since 1991, 46 percent of the string programs reported a decrease in financial support. Over two-thirds of the students enrolled at the elementary level stayed in the program through high school. The geographic region offering the most string instruction was the Northeast. The least instruction was found in urban school districts.